Postcard from Naples 12 - This postcard, too, is labeled for you: "The Messina Catastrophe - Among the Ruins - Searching for the Buried." That may not mean too much to you unless you are familiar with the geological history of southern Italy. (The science portal of Naples: Life, Death & Miracles has a number of items dealing with geology and, in this case, earthquakes. You may wish to look at a few of those.) 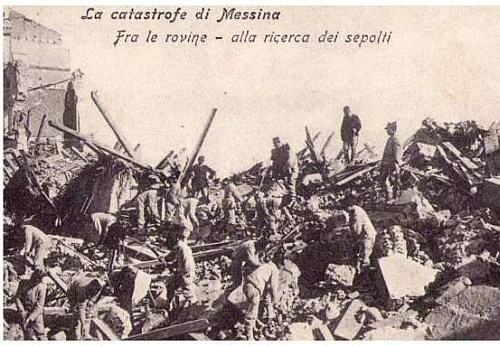 The confused photo on the postcard doesn't begin to tell you how bad the Messina earthquake really was. It struck on the morning of December 28, 1908. It is also known as the Messina - Reggio earthquake; the city of Messina on Sicily and the city of Reggio Calabria on the mainland of the boot of Italy were both almost totally destroyed. The quake struck at 5.20 in the morning. Modern seismic estimates put the intensity at a 7.1 on the moment magnitude scale (for our purposes, approximately the same as the Richter scale). The Mercalli scale, which measures not seismic intensity, but rather perceived damage to the natural and man-made environment, runs up to 12, described as "total devastation"; that is, all structures are destroyed, rivers run sideways, the earth opens and swallows you straight to hell. That sort of thing. The Messina quake was an 11. The quake killed over 100,000 people. (Some estimates of the number of dead are as high as 200,000.) Moments after the earthquake, a 12-meter (39-foot) tsunami struck nearby coasts, causing even more devastation. Although southern Italy had learned some earlier lessons from the great Calabrian earthquake of 1783, after which the Bourbon monarchy introduced the modern concept of earthquake-resistant construction, very few buildings in Messina or Reggio Calabria were built to those standards.